Dill oil is an essential oil that is used for its carminative properties and its calming and soothing effects. In ancient times, this oil was topically applied by Roman soldiers before they went into battle. They believed the calming effects of the oil protected them from becoming too nervous or stressed. It was used to protect against witchcraft or spells and added to love potions as well. Once thought as a magic potion, dill oil is one essential oil that can be used by both infants and adults. The oil is used to treat colic, as well as assist a mother in her production of milk. The oil is obtained from a plant in two variants—one is the European dill plant and the other is the Indian dill plant. The European version is cultivated and derived from locales, such as England, Romania, Germany, Russia, and Turkey. The European dill is also grown in the US. The oil from the Indian dill plant comes from India and is grown as a cold weather crop. Two types of dill oil are extracted for use. One is dill seed oil and the other is dill weed oil. The dill seed oil is derived from mature dill seeds in a process known as steam distillation. The dill weed oil is derived from the steam distillation from just-harvested herbs. Both types of dill oil vary in color and scent. The color of the dill seed oil is pale yellow to a light brown color while the color of the dill weed oil is pale yellow to yellow. The dill seed oil version is regarded for its caraway scent because it contains a higher amount of carvone content. Dill weed oil emits a fresh and spicy odor. The uses of the oil are mainly antimicrobial, antispasmodic, or sedative in nature. The oil is used as an antimicrobial because of its high concentration of the ingredient carvone. When the oil is mixed with creams or lotions, it is used to heal wounds. This oil has at least 10 aromatic compounds. While dill seed oil and dill weed oil have different compositions, they primarily act the same when used in healing or therapy. The composition of dill seed oil includes constituents, such as limonene, a-pinene, decanal, y-Terpinene, terpinene-4-ol, cis-Dihydrocarvone, trans hydrocarbon, carbone, and dillapiole. Dill weed oil contains constituent, such as carvone, limonene, α-phellandrene, 3,7-dimethyl-4,5,6,7-tetrahydro coumaran. The constituents in dill weed oil make it milder in composition because it contains less carvone and more of a substance called α-phellandrene. As noted, dill oil can be used to treat indigestion or to calm the nerves. You might say that this oil is a great stress reliever and one that can safely be used by both adults and kids. The oil’s qualities make it the ideal antidote for family use. read on to find out more about the benefits of this wonderful essential oil and how you should use it. Dill oil is actually used in several ways including food, soap and perfume production because if its wonderful aroma. However, it also has a range of potential medicinal uses and is becoming well-known for its natural healing properties. Antispasmodic properties : Dill oil can relax the body and prevent or ease the severity of various spasms in the body. Sedative Properties : Dill essential oil has mi;d sedative actions that can calm the mins and induce drowsiness which is helpful for people struggling with insomnia or anxiety. Like so many essential oils, dill can be used by people who find good quality sleep hard to come by. Insomnia can cause a range of issues for the millions of people who suffer from the condition. They include daytime drowsiness, the inability to focus and concentrate during the day and can eventually lead to a host of physical illnesses. To help get a better night of sleep, you can inhale dill oil in a diffuser or add a couple drops of the oil to your pillow or bed sheets. This oil is highly recommended for anyone who suffers from insomnia especially as part of an overall plan. You can use this oil to get rid of inflamed throats or problems with inflammation in the oral cavity overall. By adding a tiny amount of the essential oil to a herbal tea, such as chamomile tea, you can enjoy relief from sore throat pain. Alternatively, add a few drops of dill oil to a glass of warm water and use the mixture as a gargle once or twice each day. Be sure not to swallow any of the gargle mixture. Before using essential oils like dill oil internally, it is very important that you speak with your doctor first. Even a very small amount of essential oils can cause a reaction when taken internally and many are toxic to humans in high doses. However, there is no evidence that I am aware of to confirm that dill essential oil will have an effect on ADHD. It is also very important that you speak with a doctor before letting your child take dill essential oil as a remedy. Dill essential oil has antimicrobial properties including antibacterial and anti-fungal actions. (1) You can use this oil to get rid of head lice permanently. This can be done easily by diluting the oil with a carrier oil and rubbing it into the affected area or the scalp. Dill essential oil has natural diuretic properties meaning that it can be sued to increase the production and frequency of urination. You can use dill oil as an alternative to diuretic water pills to treat a urinary tract infection or UTI. The oil regulates the excretion of urine so anyone suffering from a UTI may benefit. However, it is important that you speak with your doctor if you are concerned. Some infections may not clear up as easily as others. Once you check with a doctor, you can use dill oil internally to purify the systems in the body. For the quickest result, add one drop of the oil into four ounces of a liquid of choice and drink. When consumed internally, dill provides important antioxidants to the body. Antioxidants slow the aging process and prevent oxidation. Oxidation can lead to wrinkles and premature aging. You can buy the essential oil in capsule form to enjoy these kinds of benefits. We know that dill oil has excellent disinfectant properties and it is often added to food items to protect them against being spoiled by harmful microbes. It is sometimes used internally to treat microbial infections including infections to the urinary tract, the kidneys, the bladder and the colon. However, it can also be applied topically to help treat minor wounds, cuts, bruises and burns, By applying a little diluted dill oil to the affected area of your skin, you can help prevent infection from taking hold and speed up the healing process. There are a number of reasons that parts of our body can be affected by a spasm. Spasms are abnormal contractions which can range in severity from annoying to extremely dangerous. Some of the most common types of spasm include muscle cramps, continuous coughing and hiccups but more serious spasms can result in convulsions and epileptic fits. Dill essential oil has excellent antispasmodic properties and can be used to smooth the muscles in the body. It can help relax many of the major muscle groups including the respiratory system and intestines. By using dill essential oil, you may help relieve the symptoms of a spasmodic attack and find quick relief. Dill oil may also help boost the production of milk in nursing mothers. In addition, it may help treat the breast congestion many breastfeeding mothers experience. Make sure that you speak with your doctor before using dill oil because there is no data regarding its safety for infants being breastfed. Use dill oil to support you digestive health and to stay regular. The oil supports digestive health by stimulating the juices in the digestive tract. The distinct taste of the oil stimulates the salivary glands to further promote good digestion. To receive full benefits from dill essential oil, alternative health practitioners advise that you mix three drops of the oil with two drops of lemon balm oil or lavender oil in an aromatherapy lamp. The scent of the blended oils will relax you and help in relieving anxiety or stress. The scent, which is minty, spicy, and sweet, supports sleep and relieves any cramping. Another relaxing treatment features a blend of three drops of dill oil and three drops of Roman chamomile oil. Include this mix with five drops of lavender oil and place in a diffuser or aromatherapy lamp. This combination of oils promotes concentration and focus and is an effective way to calm hyperactive kids. You can also gain a soothing and calming feeling by using dill oil when you shower or bathe. Add three drops of dill oil to warm bathwater. Doing so will stimulate and strengthen your body and mind. The oil is also contained in gripe water, which services as a treatment for colic. Use the oil in a diffuser or use it at the site as a topical application. Be sure to dilute it with a suitable carrier oil before applying it topically.It should not be ingested unless you consult with you doctor first. What are the health benefits of dill? Dill is an herb which is used as a popular ingredient in the kitchen. less well known are some of its many health benefits. Dill is rich in important nutrients and can help promote digestive and bone health. It may also help treat respiratory conditions, insomnia and infection. Dill and dill essential oil may act similar to water pills which are prescribed to increase the body’s urine production. Because of its diuretic properties, it may interact with certain medications like lithium and of course, other diuretic medications. Is Dill Essential Oil safe? Dill essential oil is safe for topical use as long as it is is diluted with a carrier oil before being applied. Consuming dill essential oil is possibly unsafe even in very small amounts. As already noted, dill oil should not be consumed unless you get a go ahead from you physician. While dill oil is considered a safe additive for food, you should make sure that it will not produce any unpleasant side effects. In some people, a skin rash may develop when the oil is used topically. To check if you are allergic to the oil, take a skin patch test prior to use. Pregnant women should also not use the oil. Women who are breastfeeding can use the oil, as it increases the oil of breast milk. Just check with a doctor first before you use the oil for specific health reasons. 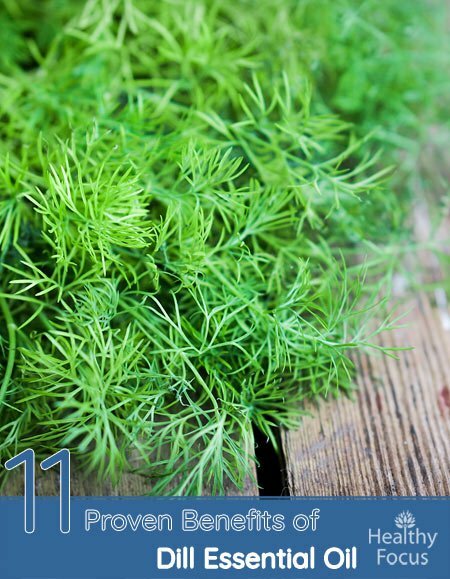 The most common side effect associated with dill is skin irritation. This can develop in people who are allergic to any plants that are part of the carrot family. Just make sure that when you use dill that you watch out for any possible skin sensitivity. That means you should store the oil so it is kept out of reach of children. Supervise the use of the oil for children, as in the case of ADHD. If you are currently nursing, pregnant, or under a physician’s care, you need to speak with your doctor about using the oil. This point cannot be overemphasized. Keep the oil out of the sensitive areas of the body and out of contact with the inner ear or eyes. Use dill oil to stimulate digestion and feel calmer and happier. This oil is the ideal oil to use whether you use it in a diffuser or you add it to a tea. If you want to ingest the oil, make sure you check with your doctor first to make sure that doing so is safe. You can also apply the oil topically. This can be done if you need to get rid of an issue, such as head lice. The primary chemical component in dill is carvone. Carvone, you might say, is the backbone of this essential oil. According to one research study, published by neuroscientists, the carvone found in dill proved to have a decided calming effect. This research finding suggests that the oil can be used to treat nervous system functioning with a great deal of success. This oil blends well with citrus-type oils, such as lime, bergamot, or lemon. Use any of these oils with dill for diffusion purposes. By combining the right oils together, you will lift your mood and feel more energetic overall. Both dill and lemon-type oils make a person feel more energetic and are ideal to use in the morning. Dill oil has a lot of good qualities—qualities that can enhance your life and help you get a better night’s rest. Whether you have problems sleeping or your child has head lice or ADHD, you can depend on this oil for a cure.